Visiting Amsterdam on a river cruise provides a nice introduction to a cosmopolitan port city to which you’ll want to return. Tulip season in the Netherlands—which extends from the end of March to the beginning of May—is one of the most beautiful times of year to visit Amsterdam. You’re not only likely to see the magnificent flowers in bloom but the weather is near perfect for touring as well. The major bulb-growing regions of the country are only a half hour out of the city. Our AmaWaterways river cruise departed from and returned to Amsterdam. The cruise began with a panoramic bus tour of the iconic city landmarks followed by a private canal boat cruise that allowed us to see the city from its waterways. Combined with a few pre-cruise days in the city on our own, we were able to get a nice glimpse of this great port city known for its charm and prominence in international trade. Here are a few of our observations. In Amsterdam, you’re likely to be walking on water, quite literally. Called the “Venice of the North,” the city has 1281 bridges crossing over 65 miles of canals. Sixty percent of the land in the Netherlands is below sea level, 40 percent reclaimed land. Instead of a big red bus, one of the most picturesque ways to see the city is on a glass-topped canal boat sailing past the charming houseboats and houses along the banks of the canals. One-of-a-kind, gabled canal houses (many with distinctive stair-stepped gables) from the 17th century (called the Dutch Golden Age) line Amsterdam’s concentric rings of canals. Without doubt they are one of the city’s most charming tourist attractions. In 2010, the canal district was declared a UNESCO World Heritage site. When built, each house reflected the individual style and tastes of its owners, many lavishly decorated to demonstrate wealth and/or status. At the very top of the houses are hoist beams and pulleys that were used to pull valuable furnishings and goods to the upper floors. Some hotels, such as the Pulitzer and The Dylan (one hotel where we stayed) occupy beautifully restored canal houses that allow guests to get a feel for their insides. Because properties were taxed by their width rather than height, many have steep interior staircases. We especially enjoyed visiting the Anne Frank House and have placed the Canal House Museum on the list of places we hope to visit next time. Heineken beer is as ubiquitous as water. Signs of every size and shape plastered across the city don’t let you forget that Amsterdam has been home to Heineken since 1864. The multinational company is the third largest beer maker in the world: Its 190 breweries produce more than 170 brands, including Amstel (founded in Amsterdam in 1870) and Moretti (one of our Italian favorites). Although the original brewery closed in 1988, the historical building reopened in 2008 as a tourist attraction called the Heineken Experience. The interactive museum recounts the history of the beer with opportunities for tastings. If you book tickets online, you can save 2 euros and skip to the head of the line. The people don’t “look” Dutch. Amsterdam is a cosmopolitan mecca. Conveniently located only about 15 minutes from the city, Amsterdam’s Schiphol Airport is the fifth busiest airport in Europe offering flights from far-reaching corners of the globe. The sprawling Centraal Railway Station (no, that’s not a typo) is another major transportation gateway, one that has been welcoming visitors from all over Europe since 1889. Coffee shops serve more than coffee. Our tour bus operator warned us soon after our arrival, if you are looking for a cup of coffee, opt for a café, bar, restaurant or hotel. He gave us that warning because Amsterdam has more than 200 “coffee shops” licensed to sell marijuana, remaining vestiges of the liberal (and forward-thinking) cannabis culture of the 70s. The official coffee shops have green and white stickers in the window. Although tourists are permitted to buy weed, they can’t smoke it in public or export it. Watch out for the bicycles. The city is relatively compact and easy to maneuver by foot or with public transportation. However, with a deeply ingrained “biking culture,” Amsterdam is one of the most bike-centric cities in the world. Abetted by an abundance of flat one-way streets, it’s estimated that there are more bicycles in the city than there are people (the population hovers around 811,000). AmaWaterways offers 15 different 7-day Tulip Time cruise departures coinciding with tulip season with stops in other cities in the Netherlands and Belgium. Disclosure: We were guests of AMA Waterways but any opinions expressed in this post are our own. What perfect timing! In a half hour I am leaving for the airport. 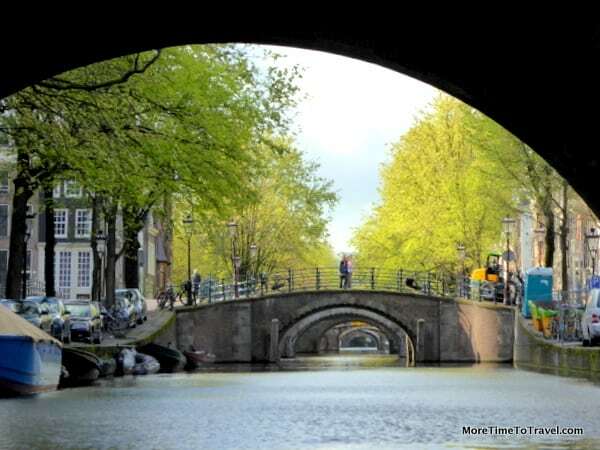 My destination is Amsterdam and an AmaWaterways Tulip Time cruise! Your excellent article and photos just added to my excitement!! Thank you! If you have any questions, Marilyn, just email me! You are in for a great trip!! I just love Amsterdam and loved reading this. AmaWaterways just created a partnership with Backroads Adventures for active bicyclists like you, Sue! Oh my do I love Amsterdam. You did a great job describing everything! We also took a tour from the glass top boat and the view of the city is entirely different. The Amsterdam in my imagination was nothing like the real thing. It is one of the most interesting cities in the world for me! Lovely photos! It is definitely a city worth returning to…There was so much more that I wanted to see! What a unique ‘tour’ of Amsterdam. I loved your pictures and insights. Ama Tours are definitely on my bucket list and Amsterdam has been for too long. oh my. you sucessfully great to describe how amazing Netherland was. i just read and dreaming about my trip there. i am studying how to write a trip. because i am trying to be a travel writer / travel journalist. any suggestions for me? your kindness firmly help me. Ah, Lovely Amsterdam. Though we have not been, I think it has many similarities to Copenhagen — with one exception. Bicycle traffic in the Danish capital is extremely regimented and organized. Everyone — bikers, walkers, and autos — all have their place and follow the rules. Even rush hour in city center is a lovely dance. By contrast, I have read that Amsterdam bike traffic is a pell-mell storm of riders! Nevertheless, Amsterdam looks so charming. Thanks for taking us along through the highlights. I loved Amsterdam and enjoyed reading this post. It brought back memories. I was fascinated with the hoist beams and pulleys. It’s hard to imagine that those spaces at the top of the buildings were once warehouses. I live in the Netherlands, so it was fun to read about it from a new visitor’s point of view! I love your tour guide’s comment at the end, though I have to add, from my own experience, that pedestrians very often step off the sidewalk into the street without looking first! I’d love to have a few days to spend in Amsterdam. I saw as much as I could just walking around for an afternoon. The Anne Frank House was a highlight for me — an incredible experience being inside the house. Amsterdam is so photogenic. Love your pics. Amsterdam is a pretty city, but I was there a long time ago. So I am happy I will be able to visit her again next year! I will have to time it during tulip season since I was not able to see the flowers the last time. Did you chance upon the Red District? Your photos are lovely and Amsterdam looks like an amazing city that deserves several days of wandering around. Hope to see it while we’re in Europe. With all the museums, you could easily spend a week or more…. I regret that we didn’t plan enough time in Amsterdam but that’s a reason to return:-). We’ve heard the beer is good! And that you have to watch out for the bikes! Friends just stayed for over a week in Amsterdam in an AirBnB while attending a conference – they loved just walking everywhere and eating at small local places. It took us two visits to get to appreciate Amsterdam and we would gladly return. It has a lot to offer. Time to Travel: Would you sacrifice time--or money--for more travel? What is it like to fly KLM Economy Comfort?